We’d love your help. Let us know what’s wrong with this preview of A Big Mooncake for Little Star by Grace Lin. Little Star's soft feet tiptoed to the Big Mooncake. Little Star loves the delicious Mooncake that she bakes with her mama. But she's not supposed to eat any yet! What happens when she can't resist a nibble? To ask other readers questions about A Big Mooncake for Little Star, please sign up. A Cute beginning book about the moon. Why does the moon change shape each night? Is it because a mischievous little star is eating it night after night until they need to bake another one? Maybe. I love Grace Lin’s artwork here. It’s almost all in black so the yellow of the moon pops off the page. The story is like having a dream. Grace said her idea for the story grew out of their families love of mooncakes. The nephew liked this story and he thought it would be great to have a sugary treat that A Cute beginning book about the moon. Why does the moon change shape each night? Is it because a mischievous little star is eating it night after night until they need to bake another one? Maybe. This is really cute and really different. It's a short, sweet (pun intended) take on an origin story about the phases of the moon. Little Star and her mother bake a Big Mooncake and the mother hangs it up in the sky and tells her daughter not to touch it. But, of course, Little Star can't sleep and thinks of nothing but going back for another nibble. Surely her mother won't notice if she just has a little bit of the Big Mooncake. But, eventually, the Big Mooncake is whittled away until it's noth This is really cute and really different. It's a short, sweet (pun intended) take on an origin story about the phases of the moon. Little Star and her mother bake a Big Mooncake and the mother hangs it up in the sky and tells her daughter not to touch it. But, of course, Little Star can't sleep and thinks of nothing but going back for another nibble. Surely her mother won't notice if she just has a little bit of the Big Mooncake. But, eventually, the Big Mooncake is whittled away until it's nothing but crumbs sparkling in the sky, and mother and daughter have to bake another one. The illustrations are really unique; I don't think I've ever seen anything like them in a children's book before. The backgrounds are all black to represent the night sky, and since Little Star and her mother are dressed in black as well, the only way we can see their bodies is because their outfits are covered in stars. I thought that was a neat touch. The pages showing Little Star eating her way through the phases of the moon (from full moon to new moon) are quite cute. If I have one complaint at all, it's that the story doesn't explain the phases of the moon going the other way (which would require a growing mooncake); kids might not take issue with that, though... and if they do, it's a good excuse to have a discussion about how the moon waxes and wanes. Overall, this is a strong picture book with a different sort of aesthetic. I'd definitely recommend this one! This has got to have been the cutest and most creative way that the lunar phases have been explained to me maybe … ever! I didn’t really read the synopsis before diving into this book, so it was a very pleasant surprise for me to discover what it was that this book was trying to teach! And this is definitely a way that I’d want to explain the moon phases to my children when (I have them and) they’re very small! I would perhaps tell them that they should listen to their mother a little better tha This has got to have been the cutest and most creative way that the lunar phases have been explained to me maybe … ever! I didn’t really read the synopsis before diving into this book, so it was a very pleasant surprise for me to discover what it was that this book was trying to teach! And this is definitely a way that I’d want to explain the moon phases to my children when (I have them and) they’re very small! I would perhaps tell them that they should listen to their mother a little better than Little Star listens to hers! This could be a fable about how the moon wanes. However, it does not explain the moon waxing. It's sweet to imagine a little girl disobeying her mother just a little bit each night but the mother seems to expect the disobedience, which feels unaddressed. I appreciate the negative space of the night sky illustrations. Lovely. Lin has created an original myth/origin story that enchants in both text and illustrations. The art is sublime--the black on black, the stars, the dust that becomes the universe....love it. Going on the shortlist for gifts for babies and kids. Better get a Caldecott too. Charming and child-centered, strikingly illustrated on an aptly black background (the starry yellow-on-black pajamas are brilliant, and I just love how the mooncake crumbs turn into stars). Grace Lin has a knack for inventing stories that feel like re-tellings of tales that have been handed down over generations. Classic. Cute story and mooncakes are yummy. This is wonderful. One of the best new books I've read in a long time. Loved this book!!! It's just beautiful and the yellow and black motif throughout is really different and pretty. I like the depiction of the moon changing shape and the monthly baking of the cake. The kid is delightful and the relationship with the mom is so sweet. It would already be five stars, but bonus points awarded for the two decorative bears at the beginning! I was so impressed by this book. Definitely a must-read! A lovely story depicting the phases of the moon. Little Star's mom makes a delicious mooncake and asks Little Star not to eat it yet. Little Star agrees...but then at night, she gets hungry and the moon cake looks so good, so she takes a little nibble. The next night she takes another nibble. Each night, she eats a little more and as she does, the moon(cake) shrinks, until finally it is all gone. A fun way to introduce the phases of the moon. Really lovely illustrations! Beautiful story to share with kids. A lovely and sweet picture book from Grace Lin! Bold and brilliant color palette, and comforting repetition. Like listening to a lullaby. 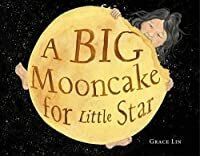 Picture book2- Big Mooncake for Little Star was named a 2019 Caldecott Honor book. Grace Lin, assumingely writing about/for her own little star, beautifully captures a bond between a mother and daughter. Grace uses the moon, stars, and space as a general motif. 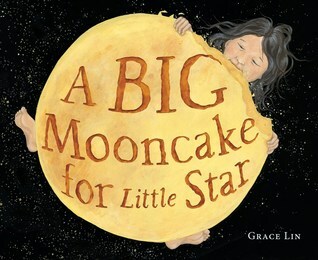 This motif is highlighted in the illustration’s colors as the pages are black, the font is small and white, the mooncake is a bright yellow to represent the moon, and the crumbs that the “little star”/daughter leaves after stealing pieces Picture book2- Big Mooncake for Little Star was named a 2019 Caldecott Honor book. Grace Lin, assumingely writing about/for her own little star, beautifully captures a bond between a mother and daughter. Grace uses the moon, stars, and space as a general motif. This motif is highlighted in the illustration’s colors as the pages are black, the font is small and white, the mooncake is a bright yellow to represent the moon, and the crumbs that the “little star”/daughter leaves after stealing pieces of the cake are yellow creating a starry night and shooting star to illuminate the page. Each night the daughter steals little bites of the big mooncake that she and her mom baked. Bit by bit the daughter is turning her big mooncake into the phases of the moon. The illustration of the mother and daughter baking together creates a nostalgic feeling when reading as an adult which can make reading this book to your children an even more enjoyable experience. Grace Lin uses third person as a narration choice but includes moments of second person point of view as the narrator addresses the audience. One example of this is when the narrator says, “And night after night, what did Little Star do?” to the audience. I am reluctant to say it is in 100% in second person because there are pages where the audience is not addressed at all. Because of this style, I think it would be a great fit for an interactive read aloud. It would be a great text to introduce inferring and predicting with kinder-second grade. It would also be a great text to use during a science lesson featuring the phases of the moon. Even though a non-print element was not required this week, I read this book as an E-book because it was more readily available at the library than the print version, which had a longer wait list. I am not sure if this happens on all E-readers (I used the kindle app on my iPad) but I was not able to zoom in on the text and it was rather small. While I do not have the print version to make a true comparison, I would not use the E-book as a format to read to a child or class for this reason. Beautiful story about the phases of the moon. I loved the illustrations. GORGEOUS art. I love the way Lin uses primarily black and yellow and negative space to create really beautiful, intricate art. This is a story that feels like it should be a myth but isn't. Got this book at ALSC and it's one of my new favorites! Love the stunning illustrations in this book. Tender story. A Big Mooncake for Little Star is a story about a mother and daughter who bake a giant mooncake to place in the sky. The daughter, against her mother’s wishes, continually wakes at night to sneak up into the sky and nibble at the delicious cake. She continues to devour the mooncake until there is nothing left but crumbs. 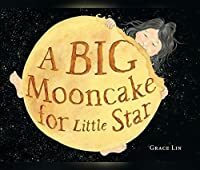 A Big Mooncake for Little Star was a 2019 Caldecott award winning book. This award is given to the illustrator in recognition of excellence in children’s picture books. The illustrations in this book are larger than life; and reveal the books additional intention – to try to mythically explain the phases of the moon. The author introduces the reader to mooncakes, which are traditionally eaten at the Mid-Autumn Festival in many Asian countries. As the story progresses, Lin playfully asks questions prompting predictions from the reader. I recommend this book for Kindergarten or first grade because this whimsical tale not only stirs your imagination about the night sky, but encourages young readers to make predictions. A Big Mooncake for Little Star exposes children to a cultural tradition outside of their own, while drawing similarities between all children; bedtime, dreams, and familial relationships. This book can be used to introduce a unit on the Mid-Autumn Festival, or can be added to a text set for a scientific unit on the phases of the moon. Very clever. And while not based in an actual myth has that feeling of Asian mythology. Amazing illustrations, the perfect anytime story but a good one for bedtime. Could be a story-time read. Might actually work to help young children to understand the phases of the moon in a story format. Little Star and her mother bake a big mooncake together. When her mother palces the cake in the sky to cool, she reminds Little Star not to touch it until she is told to. Little Star agrees. Little Star gets ready for bed and falls right to sleep, but she wakes up in the middle of the night thinking about the mooncake. She only takes a tiny nibble and then runs back to bed. Night after night, Little Star eats a little bit more of the mooncake until finally all that was left was a tiny pile of tw Little Star and her mother bake a big mooncake together. When her mother palces the cake in the sky to cool, she reminds Little Star not to touch it until she is told to. Little Star agrees. Little Star gets ready for bed and falls right to sleep, but she wakes up in the middle of the night thinking about the mooncake. She only takes a tiny nibble and then runs back to bed. Night after night, Little Star eats a little bit more of the mooncake until finally all that was left was a tiny pile of twinkling crumbs. There was only one thing to do… bake another one! This is a beautiful tribute to the phases of the moon that tells the story in an original and modern way. There are tiny touches of a folklore format here, but nothing that formal. Instead the story embraces the reader, so one can almost taste the cake on your tongue. The text is simple and has a wonderful playfulness to it so that readers are in on Little Star’s midnight snacks along with her. The illustrations are exceptional, mixing whimsy with realistic figures. Even with the first bite of the Big Mooncake, a trail of starlike crumbs are left behind. Little Star and her mother wear black pajamas covered in large yellow stars that blend into the dark backgrounds of the pages. Even the endpages are wonderful with tributes to the blue of the sky in the day, a clock that monitors the phases of the moon and milk that swirls into a galaxy when spilled. Little Star and her mom are in adorable black pajamas with yellow stars on them! The illustrations are used to good effect -- really conveying the feel of this sweet story. Black and yellow dominate the illustrations, and the simplicity and repetition evokes soothing feelings of nighttime -- while there's also a richness to the texture of the illustrations, and lots of smart, sweet, attention to detail (be sure to check out the endpapers). Little Star (with her stuffed rabbit!) is adorable. She Little Star and her mom are in adorable black pajamas with yellow stars on them! The illustrations are used to good effect -- really conveying the feel of this sweet story. Black and yellow dominate the illustrations, and the simplicity and repetition evokes soothing feelings of nighttime -- while there's also a richness to the texture of the illustrations, and lots of smart, sweet, attention to detail (be sure to check out the endpapers). Little Star (with her stuffed rabbit!) is adorable. She nibbles on the mooncake, and the crumbs evoke stars in the night sky. The Mid Autumn Moon Festival is my favorite Asian holiday, and I've been trying to pass that love on to my young daughter. Luckily, she adores its most important customs---eating mooncakes and telling stories about the moon. Mooncakes, with their molded designs, enchanted her so much that we even looked at mooncake photos online. There we discovered many different types---some flat and pale, "just like the real moon!" she declared. And with those words, a seed of an idea came. That seed blossomed into this book. It doesn't have any roots in Chinese mythology, but I tried to imbue it with all the traits I associate with the Moon Festival---quiet joy, love, and beauty. I hope it is another story you can share during that holiday or any night you wish to feel those things.